Cloudy dusty garnet color. Aromas and flavors of chocolate espresso bean, berry pie crust, and cedar with a supple, bright, dry-yet-fruity medium-to-full body and a smooth, engaging, medium-long finish with notes of dark roasted nuts, dried berries, and pipe tobacco with fine tannins and light oak flavor. A chewy, savory pinot that will shine at the table. Bottom Line: A chewy, savory pinot that will shine at the table. Pinot Noir is one of the world’s most fascinating red varieties. While many red grapes produces wines of power and youthful intensity, a wine made from Pinot Noir is often more refined with higher acidity and lower levels of tannins. The spiritual home for Pinot Noir is Burgundy, where it is produced in many styles, from very light to examples that can age for two to three decades. Pinot Noirs tend to have aromas and flavors red cherry fruit, while some offer notes of wild strawberry, plum or even floral notes such as carnation and red roses. As tannins in Pinot Noir are not as pronounced as in a grape such as Cabernet Sauvignon or Nebbiolo, most Pinot Noirs can be enjoyed upon release, which is usually two to three years after the vintage. Burgundy works extremely well for Pinot Noir, as it is a cool climate; a warm or hot climate would not bring out the perfumes of the variety. Thus growers in several countries have planted Pinot Noir in their coolest regions, looking to emulate Burgundy. These include the Willamette Valley in Oregon; Russian River Valley, Santa Lucia Highlands and Sta. Rita Hills in California (among others); Central Otago in New Zealand; Casablanca and San Antonio Valleys in Chile and the Rheinhessen, Pfalz and Baden in Germany (where the grape is known as Spatburgunder). The concept of terroir – a wine is the producet of its specific environment – is most often associated with Pinot Noir. Pinot Noirs tend to pair well with poultry (duck a l’orange is a classic match), game birds and even certain types of seafoods (as tannins are low), such as salmon, tuna and halibut. 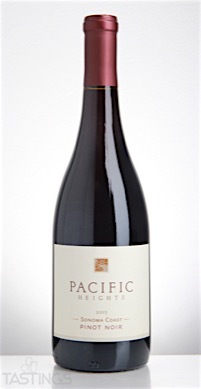 Pacific Heights 2015 Pinot Noir, Sonoma Coast rating was calculated by tastings.com to be 88 points out of 100 on 11/8/2016. Please note that MSRP may have changed since the date of our review.